Life is full of adventures. 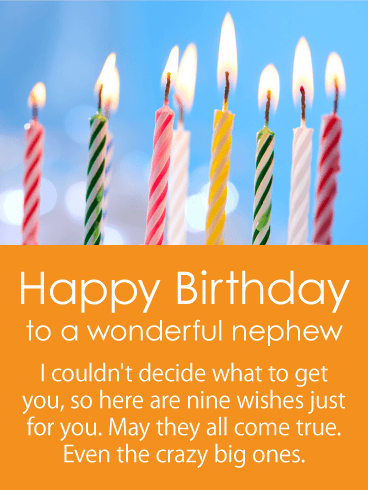 And for your nephew, his birthday is a great chance to remind him that the biggest ones are yet to come! 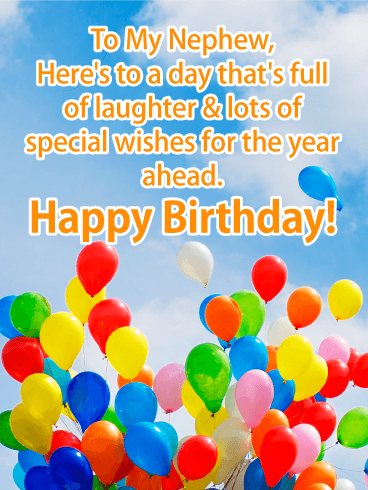 This high-flying card will make his spirits soar on his special day, while letting him know you're always thinking of him and wishing him the best on all of his many exciting journeys. 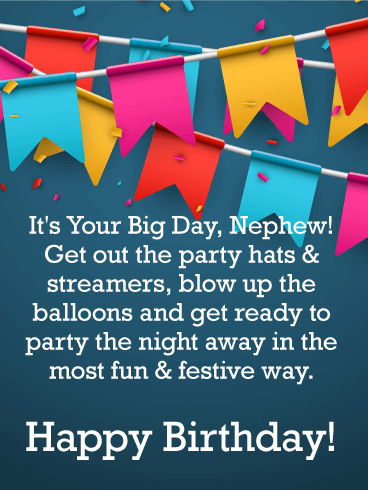 Celebrate your nephew's birthday right with this party card! 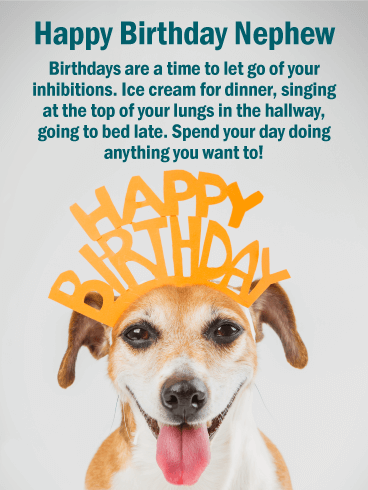 Filled with energy and good vibes, it’s just what he needs to jumpstart his own birthday celebration. 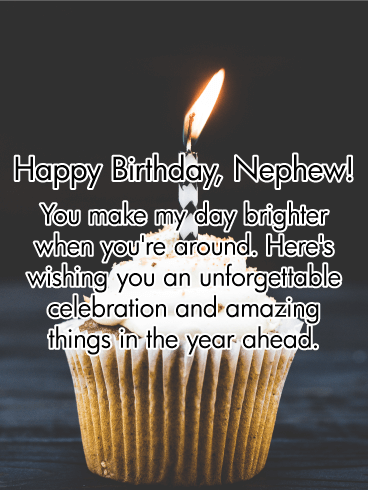 Let your nephew know that it's not another year of life that you're celebrating today, it's your nephew himself. All his accomplishments and all of his dreams. 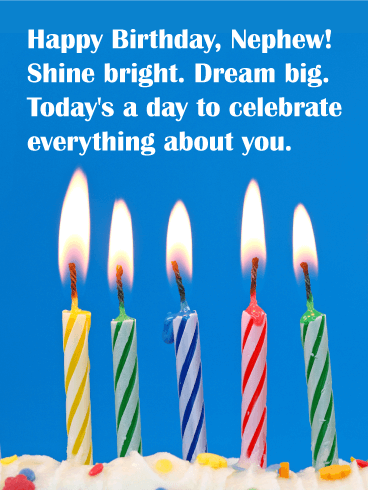 He's done incredible things, and you can't think of anyone who deserves a good day of birthday fun more. 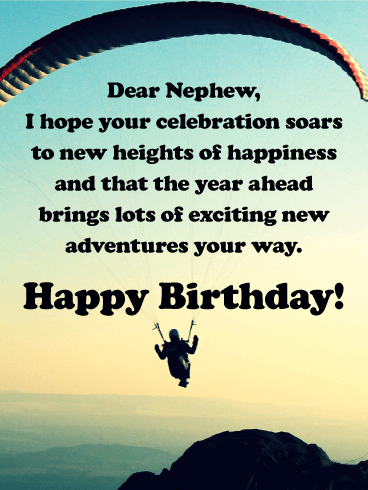 Adventures await your nephew on his birthday when you send this spirited birthday card! A white water rafter is enjoying the rapids, paddling forward on the ultimate thrill ride. 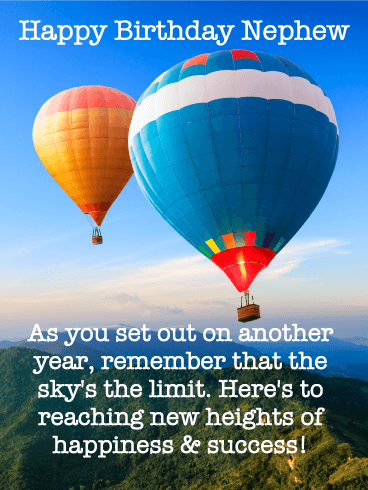 It's the perfect greeting for wishing him another year full of action-packed journeys, while celebrating the awesome person he is to you and everyone around him. 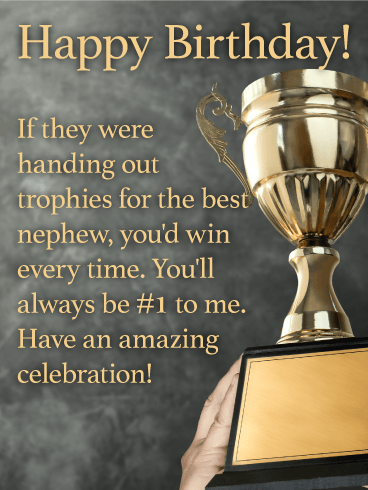 Your nephew is a charmer - he's had you wrapped around his fingers for years. Now, he's turning his smile on the world and it's going to get him far. 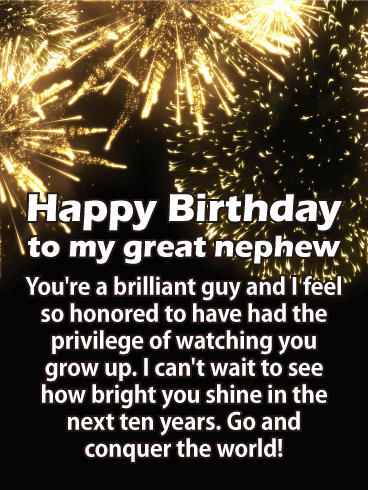 Wish him the best this birthday. Whether he enchants women or brokers in New York remains to be seen, but you know your nephew has a bright future ahead of him. 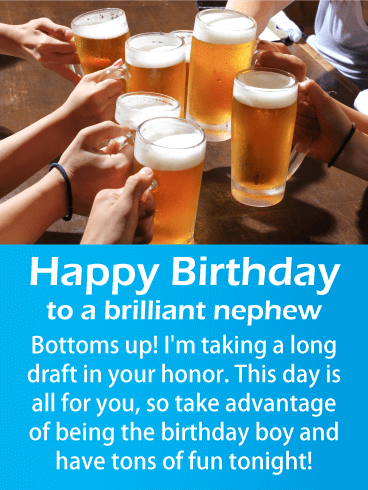 Send your nephew the support he needs to make it to the top and have a drink in his honor. No one can beat your nephew in terms of energy and adorableness, thought this dog might be close! 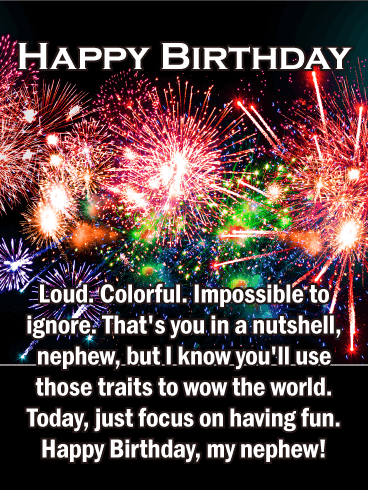 Birthdays are fun days, and this card is perfect for that. A colorful cake and a smiling dog? 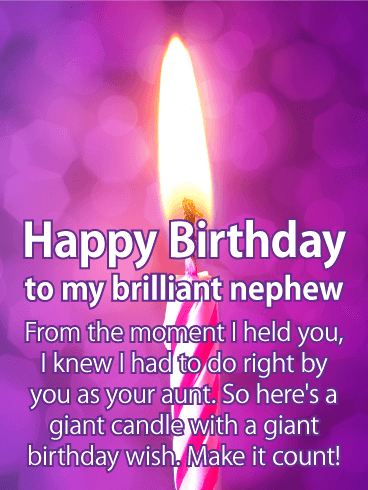 He'll grin widely and show this card to his friends hundreds of times. 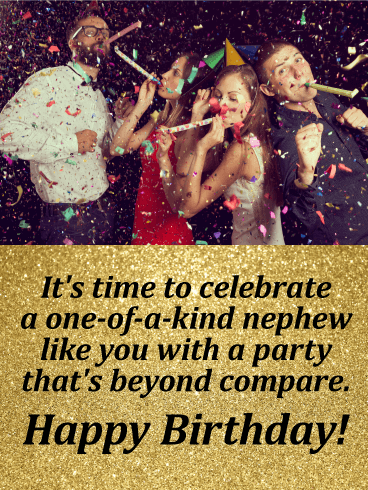 Let him know that you're thinking of him and are joining the party, even from far away. 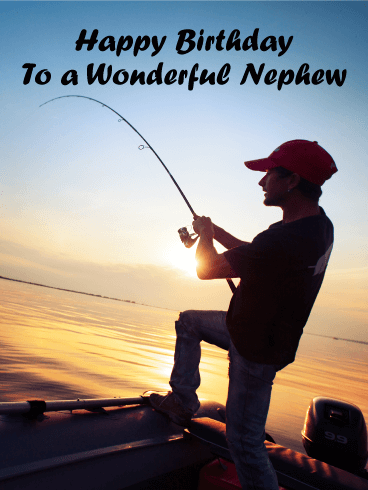 Before you know it, your nephew might label you his favorite aunt! 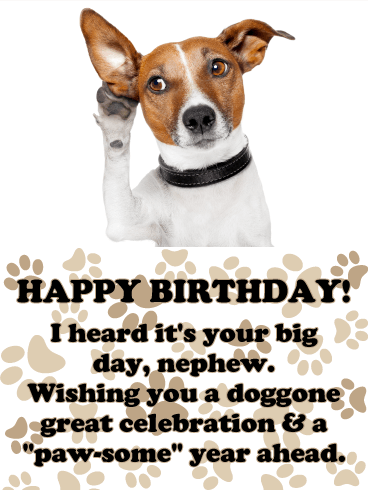 And all because of this birthday card. A warm beach. A cool drink. 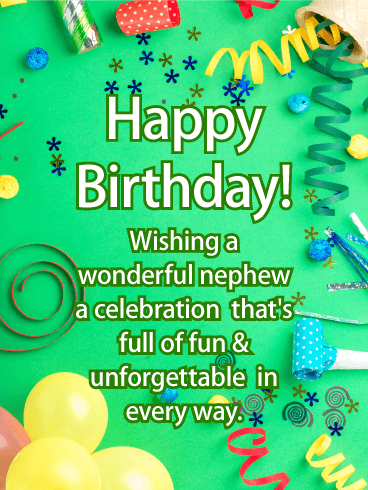 This fun card has all the ingredients to help wish your favorite nephew the happiest birthday ever! 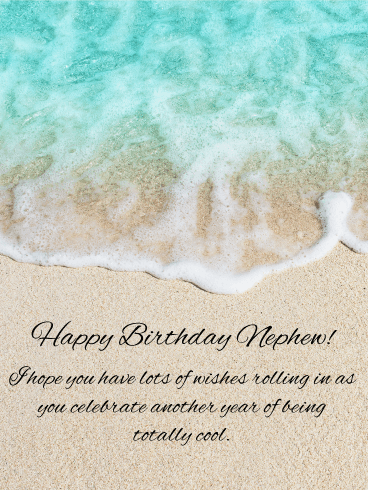 Even if sun & sand are not the way he's celebrating, this laid-back greeting will take him away while toasting him on his big day and letting him know your hope the year ahead is just as great! 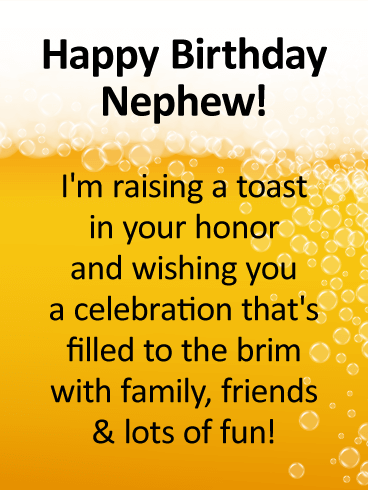 We've brewed up this fun & festive birthday card so you can raise a toast to an awesome nephew on his birthday! 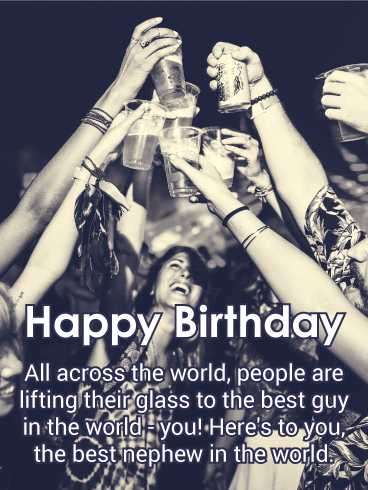 A beer mug holds your best wishes for a celebration that's filled to the brim with all the people and things that matter most. It's a greeting that will put him in good spirits, while putting a big smile on his face! 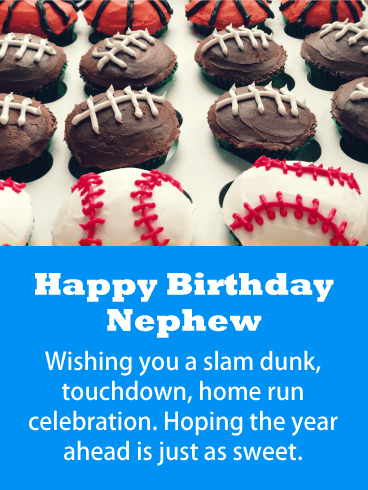 Got a sporty nephew in your life? 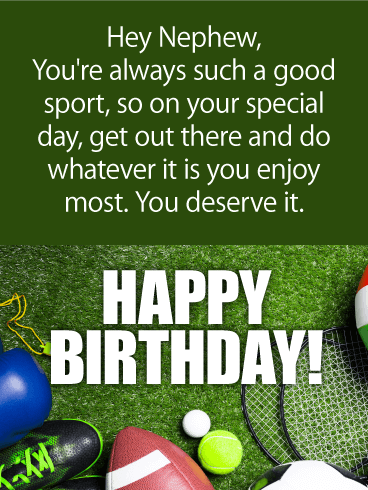 He's guaranteed to appreciate this sports-themed card on his birthday! 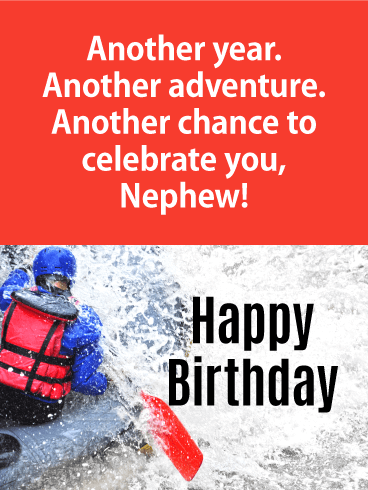 A gathering of gear at the bottom covers the playing field, while your message above lets him know that he deserves to spend his day celebrating in his all his favorite ways. 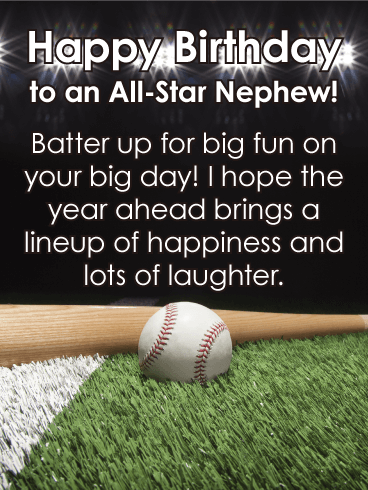 What a great way to send your best wishes for your all-star family member. A single cupcake. A single candle. 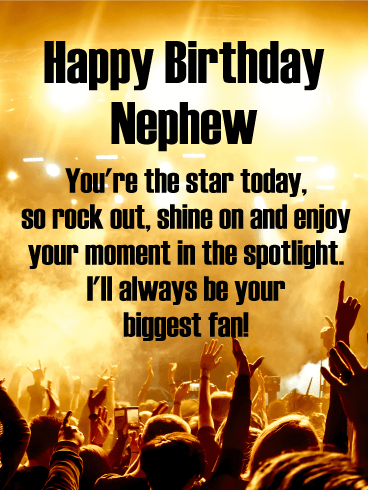 Endless wishes for your nephew as he celebrates his birthday this year! 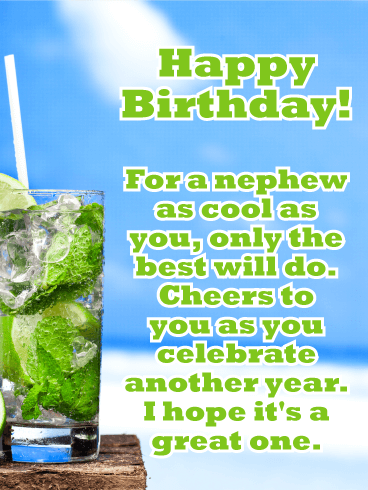 This classic, simple card captures the best part of every party, while giving you a chance to let him know how much he means to you. What a great way to make him feel remembered and loved. 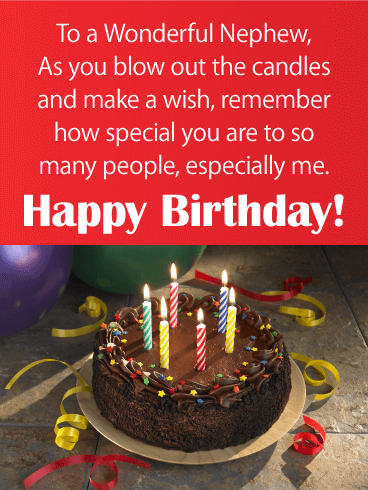 What's more fun than a delicious, candle-topped cake to celebrate somebody special's birthday? 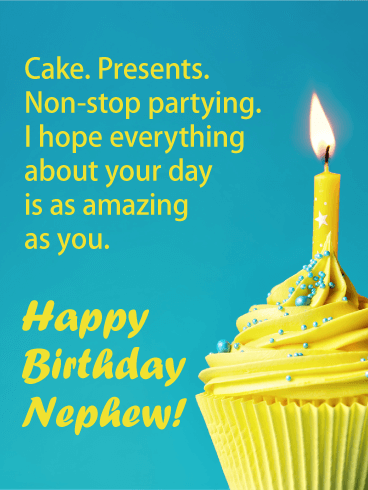 This birthday card captures all that happiness for your nephew! 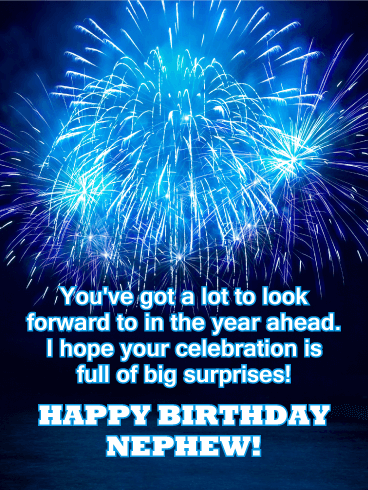 And as he blows out the candles and makes a wish, he'll know that you're thinking of him and hoping his day is filled with fun, and that the year ahead brings just as many amazing things his way. 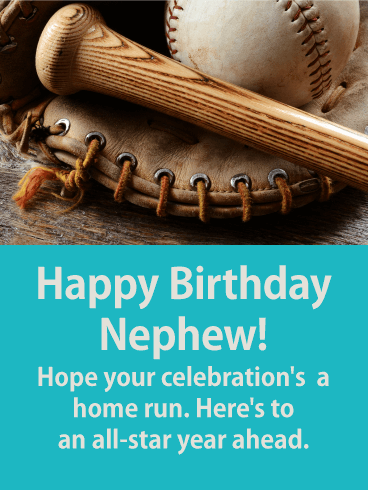 Want to hit a homerun this year with the perfect birthday card for your nephew? Then this is the one to pick! A baseball and bat sit on the field under the bright lights, bringing excitement to his celebration and reminding him that he's always an all-star to you! It's the best way to let him know you're thinking of him, even if you can't be there. 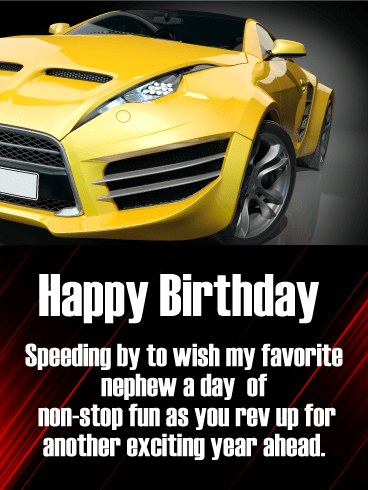 This shiny red sports car will have a special nephew revved up for the year ahead! 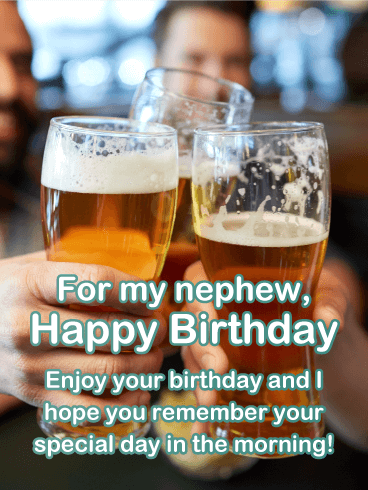 If you're looking to make his celebration even more memorable, this card is a great pick, whether you're going along for the ride or sending your best wishes from miles away. 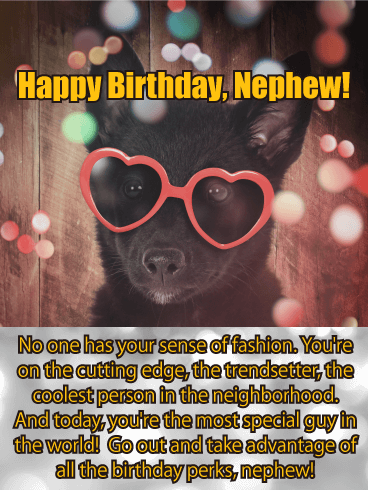 Not to get too cheesy, but your nephew's birthday is a pretty big deal! 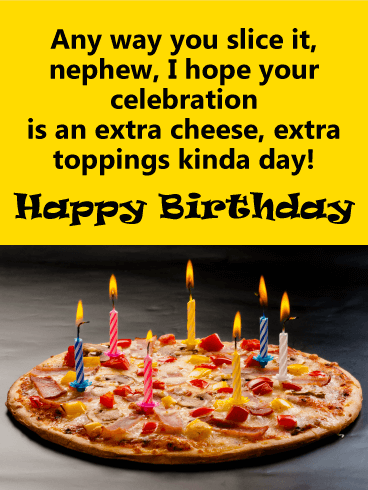 So go ahead and send this festive birthday card, complete with a delicious pizza and colorful candles burning bright on top. No matter how you slice it, he's sure to have a great day because of your thoughtfulness. 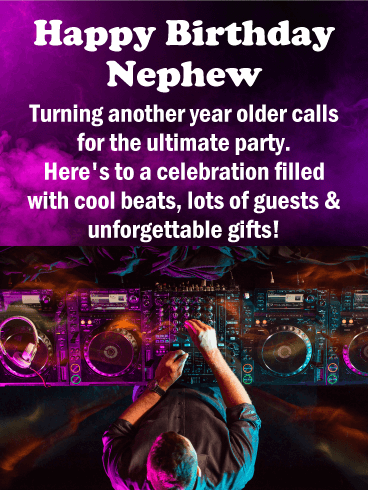 It's your nephew's birthday, and this cool birthday card will let him know you're wishing him a day of non-stop partying with cool beats and the best gifts! A DJ is spinning the ultimate birthday mix, with deep purple and blue lights flashing all around. 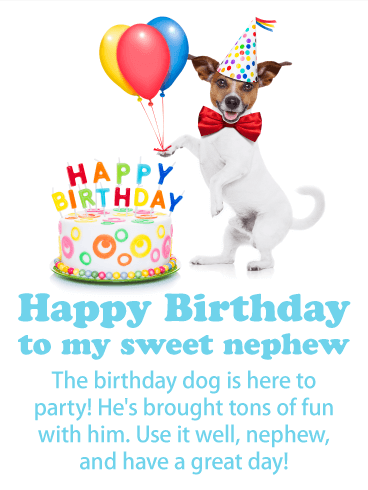 It's sure to make him look forward to turning another year older...and more awesome! 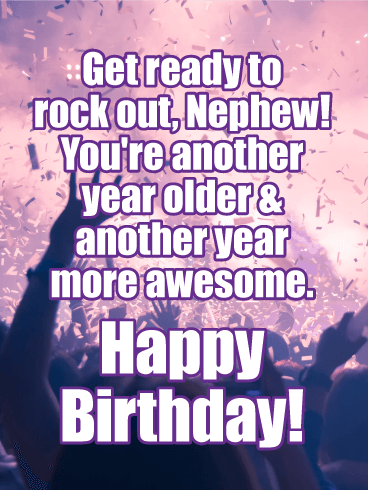 Let your nephew know he totally rocks with this cool birthday card! A pumped up crowd below and bright lights above sets the stage for an unforgettable celebration where he's the star. 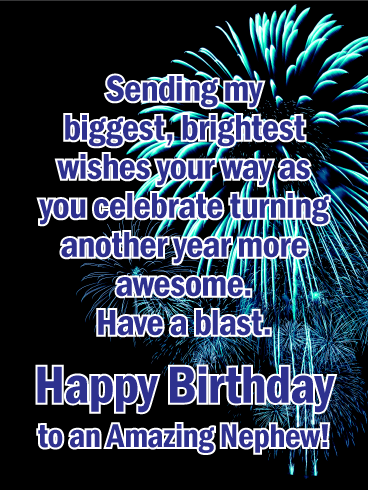 What a great way to wish him the best day ever from his biggest fan. 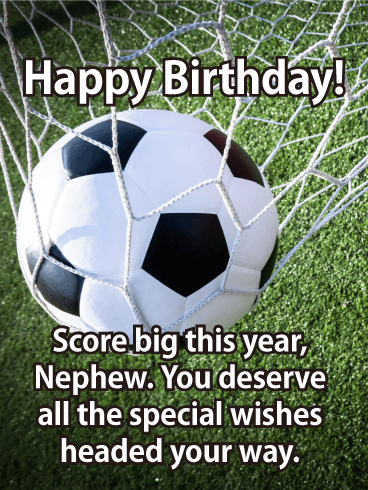 If your nephew is the ultimate sports fan, he'll love getting this birthday card on his birthday! Frosted baseball, football and basketball cupcakes are a sweet way to wish him an all-star celebration while reminding him that there are plenty of victories to come in the year ahead. 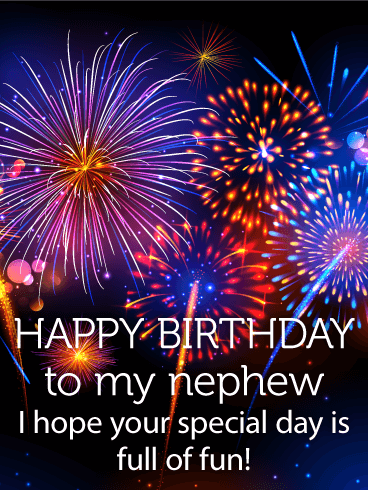 A sky full of fireworks is a wonderful way to send your biggest & brightest birthday greetings to a special nephew in your life. It's a chance to celebrate him on his big day while letting him know that the year ahead holds so much in store for him.